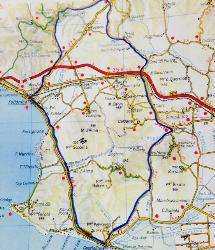 Route Follonica - Castiglione (24 km) - Staz. Gavorrano (52 km) - Valpiana - Marsili - Follonica. 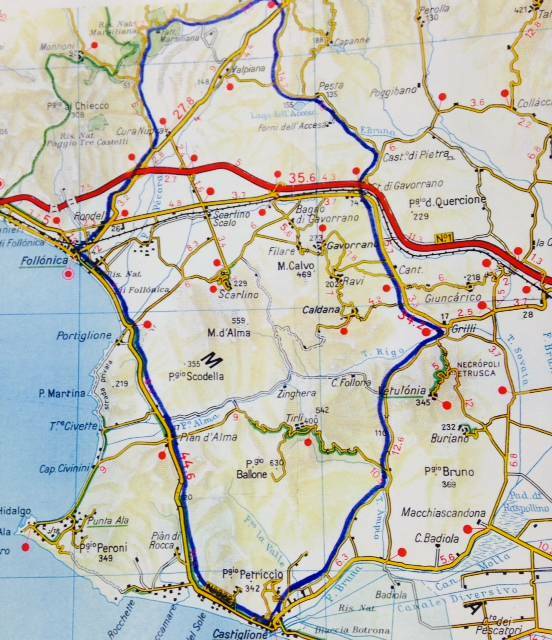 Description of the route: up to 50 km route is completely flat. Next, from Gavorrano there is a slight increase towards Vallpiana. 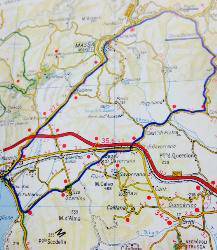 This route an lead directly to Follonica Gavorrano or Vallpiana. 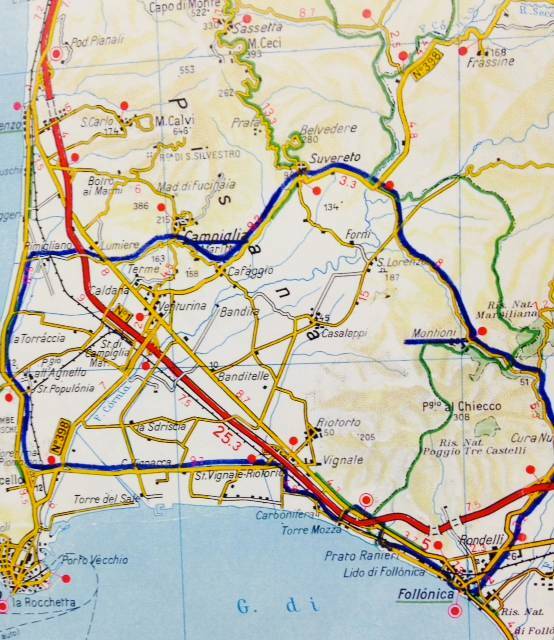 Route: Follonica - Montioni - Suvereto (27 km) - Campiglia - Lumieri - Rimigliano - Fiorentino (possibly Piombino) - Follonica. From Follonica slight difference towards Montioni. Then the beautiful road Suvereto to go up in Campiglia (about 200 mtr. Altitude). After easy path through the green hills and the return to Follonica. 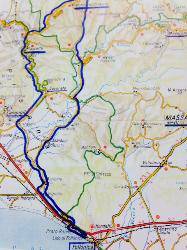 Route: Follonica - Casalappi - San Lorenzo - Monteverdi (30 Km) - climb to Monteverdi (364 m) - Sassetta (50 km) - Departure for Suvereto - Cafaggio - Riotorto - Follonica. 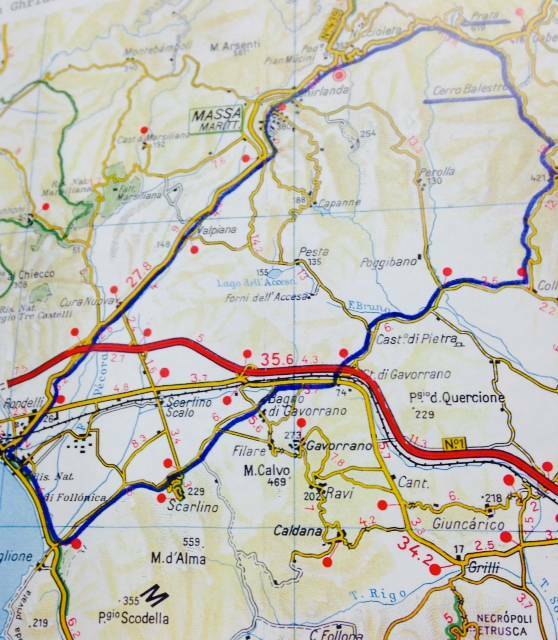 Description of the route: Slight difference in height towards Monteverdi. Then about 8 km climb to Monteverdi (you can go directly after Sassetta). The crossing of Sassetta, the descent of Suvereto and return via Cafaggio to Follonica through beautiful and charming roads. Route: Follonica - Portiglione - Staz. Gavorrana - Collacchia - Tatti - Ballestro (620 m.ü.M/45Km) - Prata - Ghirlanda - Massa Marittima - Follonica. 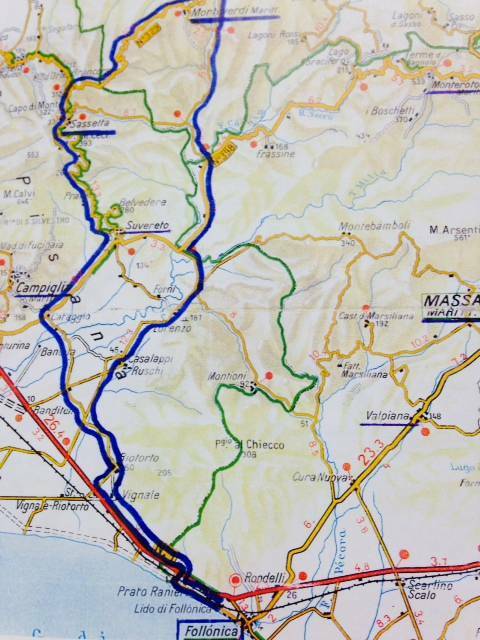 Description of the route: Beautiful road to Collacchia. Then there are 12 km climb to 620 m above sea level, Ballestro. After a descent of about 500 meters above sea level and climb to a new Prata (620 m asl), another exciting downhill after Garland - Massa Marittima and Follonica return.